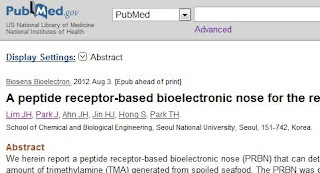 A 'bioelectronic' enose that detects trimethylamine (TMA) levels has been constructed by scientists in a lab is Seoul. It is designed to detect fish spoilage in the food industry, but perhaps it could be adapted for people with trimethylaminuria (TMAU). When fish spoils, the trimethylamine-oxide in the fish is decayed by bacteria into trimethylamine, which gives the odorous rotting fish smell. In TMAU, it is trimethylamine that causes the odor, although perhaps TMAU does not fully explain the range of odors in someone with a FMO3 enzyme issue. However it would seem trimethylamine is an excellent biomarker of FMO3 function if it is being produced in a person's gut. Apparently the sensor was 'simply manufactured' and is 'portable' so it seems that a small application for humans may be a reality in the future. 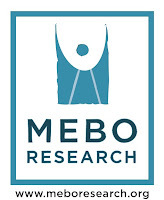 We herein report a peptide receptor-based bioelectronic nose (PRBN) that can determine the quality of seafood in real-time through measuring the amount of trimethylamine (TMA) generated from spoiled seafood. The PRBN was developed using single walled-carbon nanotube field-effect transistors (SWNT-FETs) functionalized with olfactory receptor-derived peptides (ORPs) which can recognize TMA and it allowed us to sensitively and selectively detect TMA in real-time at concentrations as low as 10fM. Utilizing these properties, we were able to not only determine the quality of three kinds of seafood (oyster, shrimp, and lobster), but were also able to distinguish spoiled seafood from other types of spoiled foods without any pretreatment processes. Especially, the use of small synthetic peptide rather than the whole protein allowed PRBNs to be simply manufactured through a single-step process and to be reused with high reproducibility due to no requirement of lipid bilayers. Furthermore, the PRBN was produced on a portable scale making it effectively useful for the food industry where the on-site measurement of seafood quality is required.